Skatepark Mosaic with HRM’s Community Arts Facilitator Kate MacLennan and local youth. (Photo collage by Tim Simony). “The Four Elements "Science art Project of J.L.Ilsley High in partnership with ArtsSmarts Nova Scotia and artist Renee Forrestall , here shown at the AGNS but currently on display at the new youth gallery at the Department of Education"
“Youth on the Radar”, extracurricular cool art programs funded by Lightshouses Crime Prevention Grants from the Department of Justice. (Photo by S. Fels). 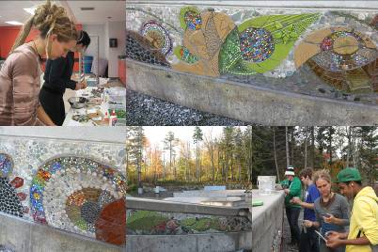 Installation of mosaic mural at a Captain Spry Community Centre Skate Park, in partnership with HRM’s Community Arts Facilitator Kate MacLennan. 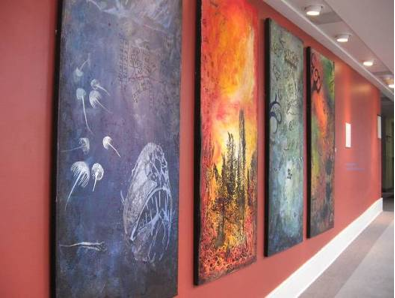 ‘Nautilus Mural of Truth’ for the Supreme Court of Nova Scotia, which was created by youth in Spryfield and ‘Team Possibles’ (young adults with Down Syndrome) under the guidance of artists Miro Davis and Renee Forrestall in 2011. Performance of the opera “Trial by Jury” at the Courthouse during Nocturne 2011, in partnership with the Gilbert and Sullivan Society of Nova Scotia. 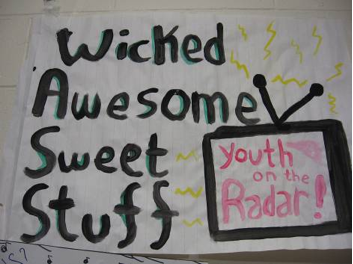 ‘Youth on the Radar’ music, dance, spoken word and film projects with Ryan Veltmeyer from Heartwood. Spoken word Performances during the visit of Michaëlle Jean, the former Governor General, as a launch of the new Youth Arts Foundation. Performances and art display at Art Gallery of Nova Scotia on December 6th, the National Day of Remembrance and Action on Violence Against Women, in partnership with the Nova Scotia Status of Women Council. Film projects in partnership with Viewfinders, the education division of the Atlantic Film Festival, includeding two documentaries for “Building Legends” about Mi’kmaq culture: The Mi’kmaq Canoe Project and the Mawio’mi Project. Partnership with Cultural Opportunities for Youth funded artists JBru for the urban music recording project “What’s the 411” and Ann Denny’s “Project Sing” bringing voice instructions to students of Spryfield. Direct support for existing arts programs and development of new arts initiatives. Coordination of arts partnerships between schools and community. Access to external sources of funding through available arts grants to enrich school and classrooms programs, as well as arts opportunities ranging from students with special needs to disadvantaged kids as well as gifted students. Emphasis on "prevention and intervention' by creating unique arts initiatives for students with diverse learning styles and those who are otherwise disengaged from our public schools." Writing and coordination of a wide range of applications for arts funding from a variety of foundations, governments programs and private as well as corporate sources. Scouting for artists suitable for ‘artists in school programs’ by forming close working connections with the local artistic community. 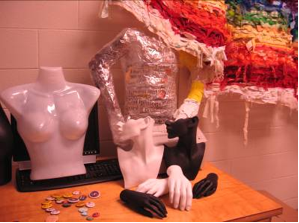 Teaching art units directly in classrooms ranging from grades Primary to Grade 12, to explore and demonstrate the possibilities of enhancing the curriculum through the arts. Offering leadership in visual arts, both at a regional and provincial level, by planning and implementing both mandated and optional PD for visual arts as well regular classroom teachers of the HRSB and other school boards. Communities served (continued): youth at risk, Gay-Straight Alliance, Youth Health Centre, student in leadership programs, gifted youth, aboriginal youth, students with special needs, youth who recently graduated from High School, homeless youth.